Perched up in a Blue Gum tree, Udo the eagle-owl had seen Zettelwitz's latest ugly deed. "It's unheard of", he tutted. "You unsavoury character, you've ruined our house and put our good friend under a spell, and now . . ."
"Don't you huff at me", Zettelwitz cut in. "I'm ruing it already." "That's utter nonsense! You just wanted the letters, you unabashed lump of bad luck! What about Ronya? Now she'll have to wait one hundred hours before the spell wears off!" Udo's questions make Zettelwitz uncomfortable. He knew that he had gone too far burning that bird house... "I'll wait until dusk, then I'll turn her back. I'll turn the others back too, but not until . . ."
"Until what?" interrupted the owl, taking umbrage. He didn't trust the unpredictable magician. Zettelwitz' patience was all used up. "Until I've united all the letters. And you're a unique opportunity!" Suddenly he began to fuss with his magic wand. "Don't use that thing on me, you underhanded old trickster!" But Udo's time had run out. 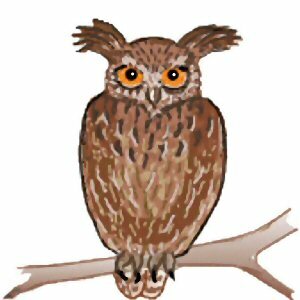 Ukulele, Umbundu - Udo owl, become a U! A THUMPING AND TRUMPETING! AN UNCANNY FLASH! Luckless Udo Bubo had been transformed into a U ! I've an unusual use for you! He left poor Udo as a U.